The Story: The fall in Ohio can be bleak and cloudy, so when a sunny day comes, it’s hard not to take advantage. It was a fall day in mid-October. A friend and I had decided to get in an early round of disc golf. The day could be described as crisp, or as they say in Spanish “fresco” or fresh. I like the term “fresh” to describe a sunny fall morning. It’s a feeling that things are new and the day could bring many great things. This photo is at hole No. 4 at Veterans Memorial Disc Golf Course in Parma, Ohio. We generally start on hole No. 1, which faces west. The next two holes also face west. Turning east to hole No. 4 was the first real view I got of how grandeur the sun was projecting in my direction. The hole plays from an open area into the trees, and as I got to my disc after my drive, I looked up and saw my friend standing with a perfect and sunlit group of trees at his back. With the basket in the foreground, it seemed like the perfect shot. There was just a little bit of fog, giving the area a little mystery. There was also the right amount of sunlight to project rays through the boughs and fog. I pulled out my phone and hoped I could capture, even if just for the memory, a little bit of what I like the call the perfect day for disc golf. I’m sure many of you tournament players out there have experienced the feeling of having your name called out after an event and being handed either a gift certificate or cold, hard cash when you place or, better yet, win. To be fair, I kind of already experienced it. But both times were pretty cheap — and I’ll be the first to admit it. I won’t be making a living off playing disc golf, but it still felt cool to get this. When I first started playing, I somehow won the first tournament I was involved in. It was non-sanctioned, and the other person in the division was just as new as I was. Basically, we were battling to see who wouldn’t finish last. 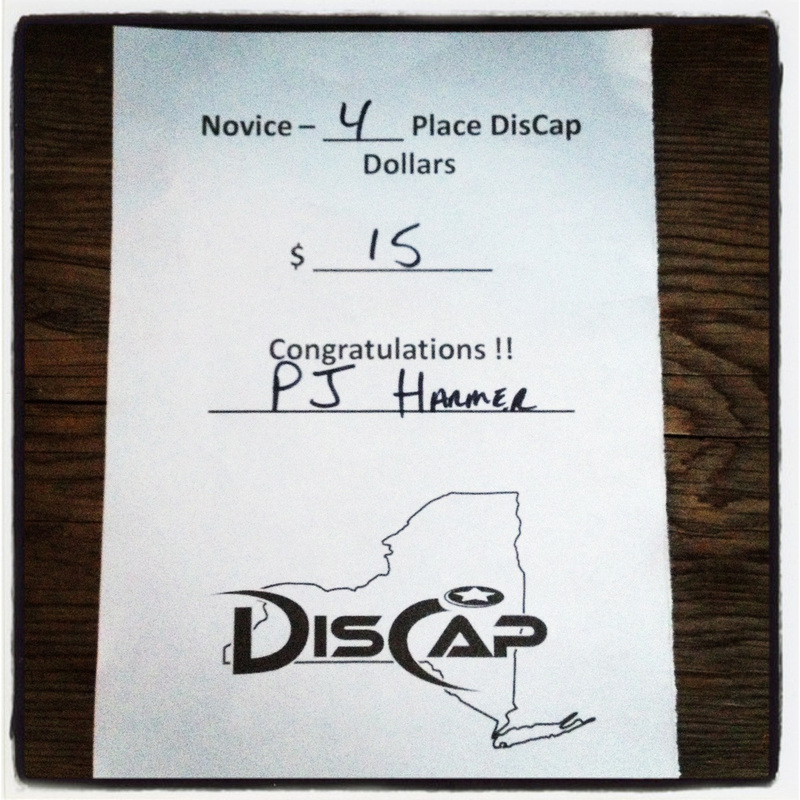 I also somehow won a PDGA-sanctioned event. But I was the only person in the division and the tournament director was kind enough to leave the division intact and not force me to move up and get whipped. Needless to say, I never really experienced the feeling of cashing. My normal goal when I play in a tournament is to not embarrass myself. That basically means I try not to melt down and I hope to avoid big-number holes. But if the course is long and for big arms, I usually start dragging by the end of the second round. I get pretty beat up and it makes the game no fun. Poll 38: What’s the oldest piece of plastic you carry? OK, old timers (and newer players), it’s time to figure out some ages. Now I realize some of you players will go and buy an older disc because of its plastic or whatever, but that’s not necessarily what we’re seeking here. One of the Rattling Chains folks sent me an idea for this poll and I really liked it. I’m not too sure if this is exactly how he saw it, but the more I thought about it… well, the more I got curious about the way we’ll be doing this poll. Let’s check back for last week’s poll first. We wanted to know how long you’ve been playing this fine game of disc golf. We had 189 responses for this poll. The winning choice was 3-5 years, which received 38 votes (20 percent). You’ll notice it’s not a crazy majority here as the votes were extremely spread out. A year or less took second (36 votes/19 percent), followed by 1-2 years (34 votes (18 percent), 6-10 years and 11-20 (25 votes/13 percent each), 21-30 years (18 votes/10 percent) and more than 30 years (13 votes/seven percent). That’s quite a spread-out set of data, which is good. It’s nice knowing people of all experience have stopped by here! The story is the same for every disc golf manufacturer. 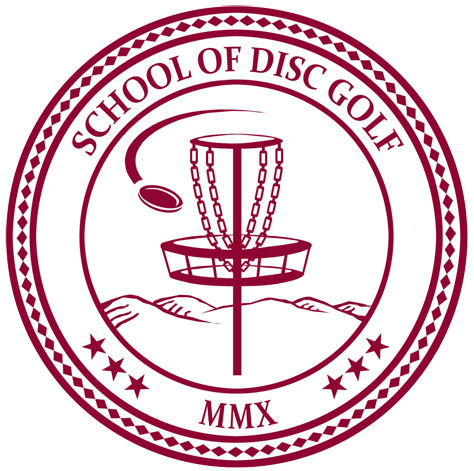 Follow along with me if you’ve heard this one before: Two teenagers find disc golf and fall in love with the sport. At the same time, the young men spend their summers working for their father, who just so happens to own a plastic injection molding company. One day, the teens approach their dad with the idea of making a golf disc and, thinking it will be a good learning experience, he gives them the green light. The disc catches on and soon, a company is born. Wait, that’s not how every disc golf brand is created? Well, chalk up another point in the “unique” column for MVP Disc Sports. 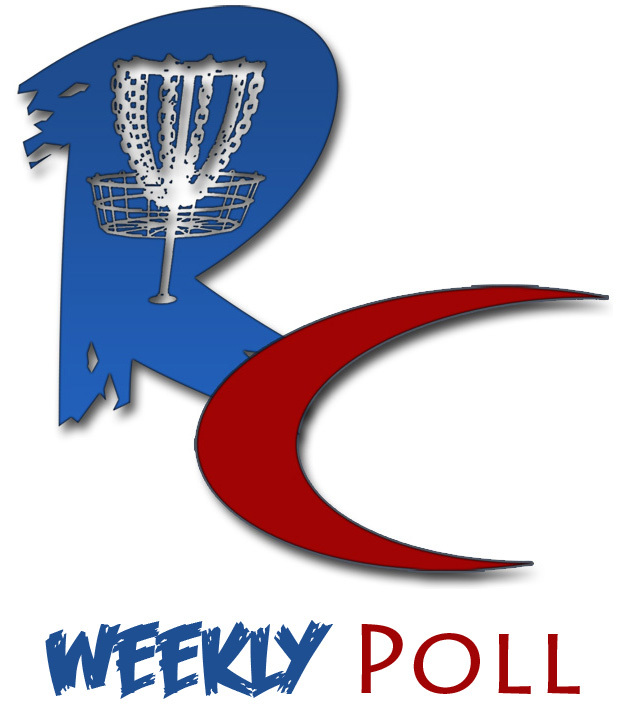 Now 21 and 23 years old, respectively, brothers Brad and Chad Richardson have used a grassroots following to build MVP into a competitive company that continues to strengthen its position in the market via a new spin on disc technology. And it all started, oddly enough, with a car door handle. Maple Valley Plastics, owned by Don Richardson, has been in business since 1967. In addition to making a variety of products for government contracts and toy companies, the primary focus of the business is the automotive industry. After seeing an interior door handle that was made of a stiff core material and covered with a rubber-like material for a soft feel, Chad was inspired to apply the design to a golf disc. Allow me to take the time to thank everybody who has given us feedback during the past couple of polls. Recently, a few of us have been wrestling with how to move forward with the future of Rattling Chains. I have always realized how big of an undertaking this blog is and I’ve often felt blessed with having so many talented writers join the staff. The reality is, I’d never have gotten through nearly 10 months without having a staff — an unpaid volunteer one at that. Alas, one thing I always knew would happen would be change. Jumping into something like this, there was always the realization we’d have to change with what worked and what didn’t. And, with no money involved, you have to roll with the punches the blog brings, such as content. Remember, everybody who writes for this site does it because they love to write about a sport they love. And, real life takes precedence. During one of those stretches, my will was tested. Not because I was mad or upset at anyone, but because I faced the reality of what this site is. It’s an endeavor I took on without having anybody else to write. I got lucky people wanted to be involved and jumped on board. And they believed in what the vision was. As the site has grown, it’s taken different forms. We went from being a seven-post per week site to three and, currently, back to five. We’ve been pretty good about doing things on a regular basis and it’s been fun. This isn’t a job, however. Writer’s block happens. People have other things come up. The site becomes a bore in stretches because one just doesn’t want to write. I spent many years in newspapers — I understand it happens. 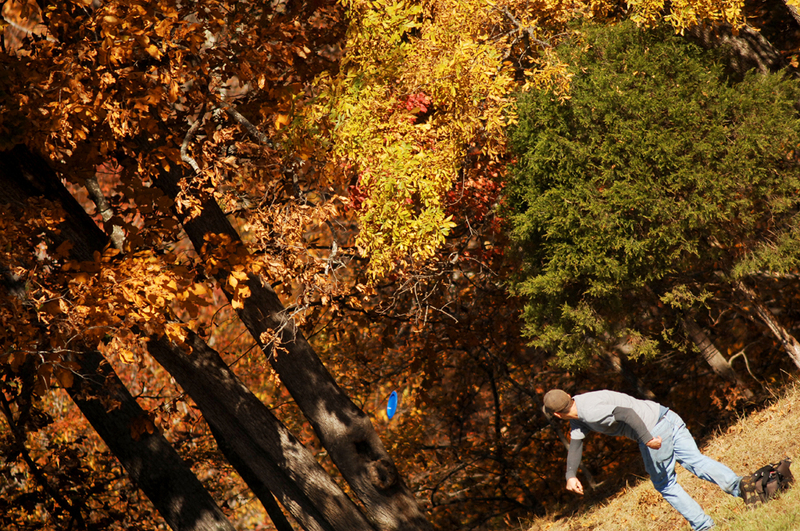 The Story: Fall is my favorite time of year to photograph disc golf. Not just because of the bright fall colors, but the light has a great yellow hue during the afternoon. This is one of my favorite images from the fall. The blue disc in contrast with the orange and yellow leaves really appealed to me. This was an approach shot on hole No. 15 at Hawk Hollow in Spotslvania, Virginia. Hawk Hollow is the most photographer-friendly disc golf course I’ve ever been on. For this shot, I hung back about 50 feet and used a 300mm F/4 lens to get this shot. When I realized he was going to throw an overhand shot, I tilted the shot to make sure I got the disc in the frame. This week, we’ll be covering your time in the game. It’s funny because in my short time playing this game, I’ve come across people who have been playing for 30-plus years and still have the crazy love for it. But I’ve also noticed the generation gap of long-time players and newer players. There’s definitely a different feel. Maybe it’s because it seems like there’s so much to digest when starting now. Starting way back when, it was more minimalist. These guys (or gals) had the chance to grow with the sport and technology. Anyway, we’ll get back to that in a moment. Let’s quickly re-visit last week’s poll. I say quickly because we didn’t get much of a turnout for this one, which is quite disappointing, if not just because as writers we’re interested in what the readers want to see. As I noted in the post, we won’t necessarily be changing things based on the poll, but it helps us when deciding future things. I’ll be covering the past two weeks worth of polls as well as some other things about the site in a post later this week. Last week we asked about the content you, the readers, like best on Rattling Chains. Each person was allowed to vote for two options. We had 65 people cast votes, for a total of 122. 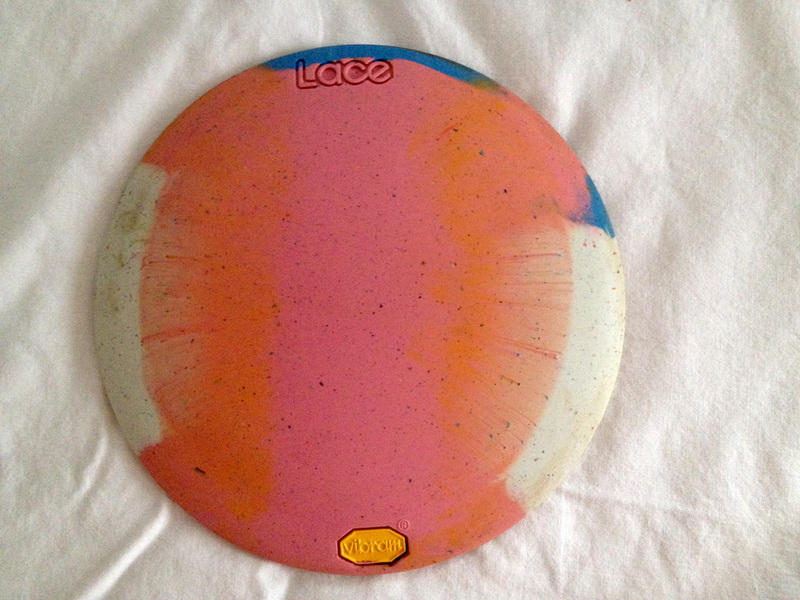 Last week, we ran our review of Vibram’s newest disc, the Lace. The disc is the first long-distance driver released by the company. And the winner of this disc is…? 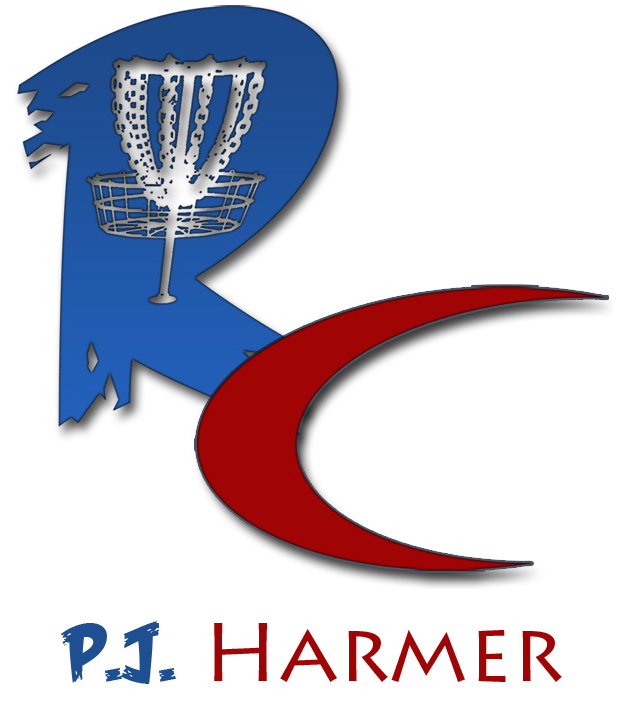 In conjunction with the review, we also were giving away the disc used by P.J. Harmer — a 173 gram beauty. Between the comments on the website and the re-tweets, we received more than 50 entries for this disc. That’s awesome, especially knowing somebody is going to be lucky enough to own this disc! There were some great comments about Vibram and its line of discs on the original post, so I’d encourage you to go back and check out those. If you haven’t already, go check out our unbiased review. We give a different look than most reviews, offering an objective look from the eyes of two players of vastly different levels. Anyway, enough of the blabbing.